Grey Junglefowl is a large bird from the Phasianidae family found mainly in the south Indian peninsula. The males are bigger and colorful making it distinct from the female. Photo 1: Exif- f/5.6, 1/30s hand-held, ISO-800, 500mm, Nikon D7100, 200-500mm f5.6E. Date- March 6, 2016. This photo is from Thattekad sanctuary, Kerala, near the watch tower. Got this during the morning birdwatching walk as a part of the stay in the watch tower. The time was around 6:45 AM, when the light was low inside the forest. There was a pair of them. They were moving swiftly from one location to another. For a few moments, this male bird made a pause and looked around. And I got a few clicks. Although this is a view from the back, I think the head turn pose made it nice. The bird looks very beautiful from the side view too. Also, the shot of the female was missed – will try to get it next time. 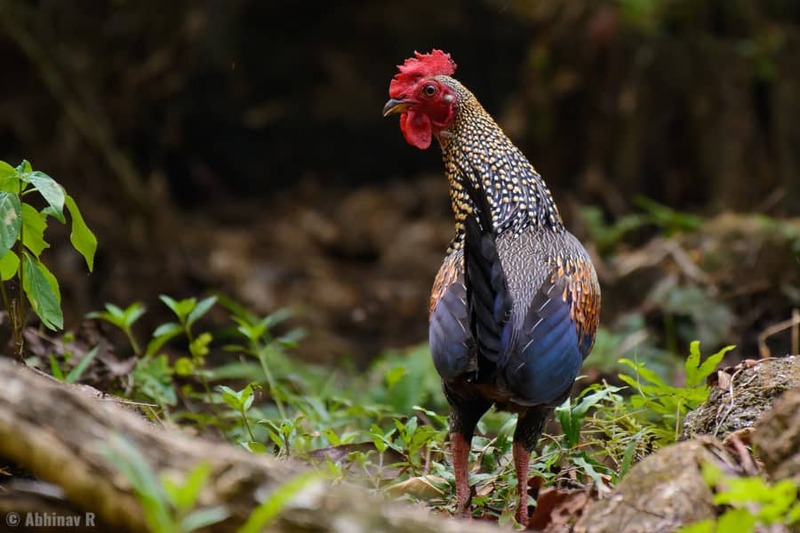 The Grey Junglefowl is one among the two jungle fowls found in India. The other one is Red Junglefowl, whose male is a little smaller in size than the grey. One more species is found in the Indian subcontinent, which is endemic to Sri Lanka – The Sri Lanka Junglefowl. Appearance: Although the primary color is grey, there are different patterns and colors all over its plumage. The head is bright red with red color wattles and cape. The neck region is heavily spotted with yellow. Coming down to the upper body, there are different lines and patterns. There is also some brown-orange coloring by the sides on the wings. Wings have dark blue shade. The tail is also dark blue. Like other jungle fowls, the tail has a long feather extending backwards. Size: Male is around 80cm and female is about half of that. Distribution and Habitat: It is a resident bird mainly in the southern parts of India. Deciduous forests and hill stations are their main habitats. This usually shy bird make very loud calls. Mainly active during morning and evening. In hilly areas, there is more chance of spotting them along clearings or roadside during this time. Hunting is a threat for this bird.